They discover the man in black following them in a boat. And it is, Inconceivable! They realize the man’s boat is gaining on them. Inconceivable! While climbing the cliffs of insanity on rope that only Vizzini’s Giant was strong enough to use, they discover the man in black following them up the rope – gaining on them. And again it is, Inconceivable! After cutting the rope once they reach the top so that the man in black would fall to his death, they discover he caught himself on the rocky cliff with his bare hands. And, of course, it’s Inconceivable! This humorous line has over the years become a meme used to question whether people really know what they are taking about. On the internet, it is usually accompanied by a picture of that swordsman… a character named Inigo Montoya from what 1987 classic comedy romantic fantasy movie? Yeah, it’s a great story, isn’t it?! An iconic story about true love. Right? The lengths to which true love will go, the inability of a person, an evil plan, a villain to stop true love, to keep two people in love apart. Or is it? In fact, there is a telling line from this movie that the man in black says, just before he reveals his true identity to Buttercup. Buttercup speaks of her long lost love. The man in black mocks her because she is now engaged to the prince who she does not love. “You mock my pain!” says Buttercup. The man in black says that he remembers the farm boy she claims to have loved. And he eventually provokes Buttercup to the points that she pushes him down a hill out of anger. Jesus has a similar message for us. He was a peasant man who taught through parables. Parables that tried to show the people of his day that the world was not as they thought, that faith and religion were not as they thought, that God was not as they thought. And yet it can be so difficult for us to see and hear the revolutionary messages in Jesus parables. We do not know the context of Jesus’ world, we cannot hear the themes, see the images, and understand the symbols because the world today is different that it was 2000 years ago. 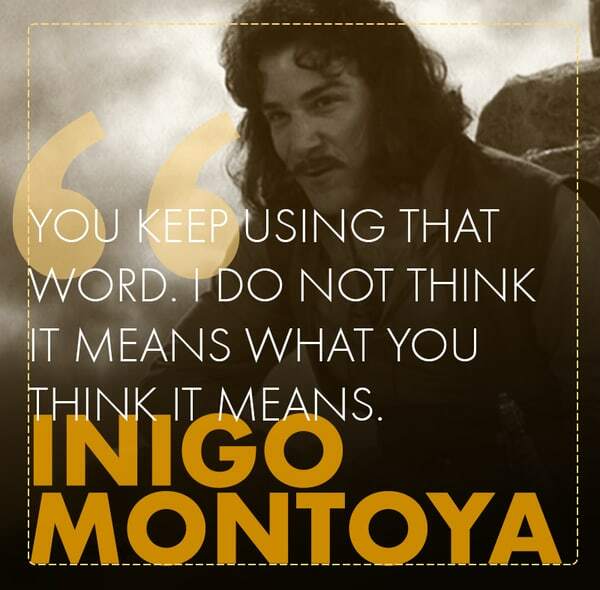 Today, I invite you to pretend that Inigo Montoya is right – that these parable may not mean what you think they mean. Throughout this service I want to share some insights into these parables that will tell of a different meaning in the story than what you have most likely heard. I invite you to open your eyes and ears to the message of a kingdom built on a love that is much deeper and more profound than any romantic comedy could hope to communicate. A message that cannot be contained in one story, but takes many stories to convey. A message that lurks beneath the surface of what we typically preach today, a message that speaks of a kingdom that is unlike any the world has ever known. Let us begin our worship today by asking God to open our eyes to this kingdom that we might see and hear and know of the deeper and truer meaning to which God is calling us right now. We typically read this parable as a metaphor for how the kingdom starts out small but will grow to be huge. It gives us hope when we feel like our small efforts are not making much difference. It inspires us to keep trying knowing that even the small things we do can one day have world changing impact. But I don’t think this means what you think it means. Matthew, Mark and Luke all tell this parable, though will interesting variations. First off, the mustard seed was not the smallest of all seeds. Luke does not even suggest it is the smallest of all seeds. So is focusing on the smallness of the seed really the point? Second, Luke says the seed grew into a tree. Now, a mustard plant was not a tree at all and certainly not great. Why would Luke write such an exaggeration? Matthew and Mark simply say it grew into a vegetable plant. Now they do add the greatest of all plants. So it seems they all want to communicate something great about this plant. Luke speaks in hyperbole. Matthew and Mark use a Greek word you are familiar with: megas . It’s a mega-plant! Megas can refer to something being large, sure, but can also mean surprising, intense, and violent. Now when you also realize that mustard was an invasive weed during Jesus day, the whole parable begins to shift in meaning. Mustard seeds, though not the smallest seeds around, were small enough to seem innocent, harmless. But put them in your garden, and they will take over, they will outgrow everything else, become this aggressive mega plant that will violently take out your other vegetables. Mustard you see was thought of as a weed. It had some medicinal qualities and could even be used for seasoning. But it was not worth putting in your vegetable garden because it was invasive and aggressive. It acted like a weed. It affected your other plants production. It was incredibly hard, near impossible, to control. It would reseed itself, and keep coming up rapidly again and again. This is what the kingdom of God is like. Not just something small that grows large. But rather a violent, aggressive, invasive force that will take over all that you have spent so much time cultivating. Rome maintained the political and social order of the day. The temple maintained the religious order of the day. In fact, the temple in particular was the institution that maintained the purity system of Jesus time. The garden – pure, pristine and orderly with its vegetables – is, in this parable, made unclean by the introduction of the mustard pant. The kingdom works the same way…invading the purity system of the temple. This parable is essentially a story which tells that same truth enacted by Jesus when he turns the tables over in the temple – aggressively running out the system of purity and offerings that exploited people. The kingdom of God turns the Temple upside down, throws out its exploitative practices and inaugurates a new order by cleaning out the old order, just as the mustard takes over the order of the garden. Birds would have ruined the garden as well. They didn’t fit in an orderly garden because they would wreck havoc. So, the farmer would have done everything possible to cast the birds out of the garden. The birds are the outcasts of the social, political and religious orders of the day. And yet the mustard weed – that is the kingdom – gave a home to those whose were, like the birds, cast out. The mustard seed: I don’t think it means what you think it means. The kingdom of God is like a weed – agressive, invasive, revolutionary. It will take over the systems and powers of the day – be they religious or social or political. And it will bring about a new order that will give life and rest and homes for those pesky birds that our society casts out. We know this parable as the parable of yeast. And when we think of yeast today, we think of nice little packages or jars of yeast that we purchase to put in dough to make it rise into the warm, soft, fragrant smell of delicious fresh baked bread. It’s a cozy, feel-good, family symbol. The kingdom of God is like that…the thing that makes bread soft and yummy. The kingdom permeates our lives, causing us to rise to goodness. The kingdom is like yeast. Yeast, or Leaven as it was called, is moldy rotten dough. Leaven, you see, was the leftover dough that was allowed to rot or ferment so that it yeast – a fungus – from the air would land on it and breed in the dough. You did not buy yeast in a package from the store. You let your dough rot and you added that rotten dough to the next day’s bread. That’s how you got yeast into bread so that bread would rise. Now, don’t you want to eat some bread made this way? It’s not the warm cozy image that we tend to start with is it? It’s kinda gross…and makes you want to pass on eating that bread. Because leaven was rotten dough, it was used in scripture (and in culture, in general) during the time of Jesus as a symbol of corruption, of evil influence. Leaven signified anything that was rotten, corrupt, immoral. And for proof, you only need to go a few chapters later, Matthew 16 to hear Jesus use this metaphor: “Watch and beware of the leaven of the Pharisees and Sadducees.” Luke quotes this same saying but adds that their leaven is hypocrisy. This parable is now totally gross. But we haven’t even got to the good part! You see, the story says that the woman takes this rotten dough and hides it in the fresh dough. That’s right, she hides it! Not so keen on mold in your bread…week, you won’t know anyway, cause she hid it behind your back! The kingdom of God is like that… rotten bread that gets secretively hidden in the dough and allowed to permeate corruption all through it. Not exactly a pretty story about the the gospel’s ability to transform the world causing us to rise to God, is it? But think about it this way: what if the bread that the woman’s guests were expecting symbolized the norms and values and traditions of that day. What if the bread is like that garden from the mustard seed story…pure and unleavened just like the temple prescribed it for religious occasions? And what if the kingdom of God was hidden by folks – maybe even folks like women whom no one would listen to or give authority to at that time? What if the kingdom was more known to those kind of folks and so that had to hide it within their actions and words and duties and responsibilities because no one would listen to them? And what if that kingdom hidden within their lives would infiltrate the religious purity and social order of the day corrupting it all? Can you begin to see how this story is revolutionary? How it used an old symbol and to communicate a subversive message? A message which says the old way is changing into a kingdom way and folks don’t even realize it! Because those seen as the very least are hiding the kingdom and serving it up to those of power and influence to change them, to lead them to a new way, a way that will seem corrupt to them, but is in truth the way of Gods. Wow! Weeping and grinding, sometimes translated gnashing, of teeth. Good fish bad fish. Evil people, righteous people. Burning furnaces. This passage has all the markings of a hellfire and damnation sermon, doesn’t it?! And that is often the way it is understood and preached. As a story about God’s judgement, about who is in and who is out, about being good versus doing evil. As a way to coerce someone to faith or to provoke someone to pray for salvation. But I don’t think it means what you think it means. Look again at the way this story begins: The kingdom heaven is like a net…a net which catches fishes of every kind. That’s it. The kingdom is like a net…a net which reaches deep and wide to pull in all different kinds of fish… every kind. From the text, no fish is left out. The kingdom reaches out to all of them. So if the kingdom pulls in every kind of fish, why the rest of the story about good fish and bad fish (or literally, rotten fish), why this evil and righteous explanation, why this sorting of one from the other, and what about these Angels that burn rotten fish in a furnace at the end of this age? What does end of this age mean? Why is it that angels are doing the separating? And how can fish be rotten after just being hauled in from nets? Fresh fish straight from the ocean….already rotten? This metaphor just doesn’t make complete sense. First, Whatever God’s judgement looks like this parable certifies, as do other parables such as the wheat and tares, that separation come at the end of this age…. when is that? Well, not now. Not during a time such as this. Not even in a future related to this time. But instead something that is called the end of this age, this time, this history. What we can take for certainty from this idea is that judgement is not for us in any way shape or form. Second, humans have nothing to do with the separation. That is the work of someone, something that is other than human. Angels according to Jesus explanation. Again, what we can take with certainty is that judgement is not the work of humans in any way shape or form. Third, some would say that good fish are good people and bad fish means bad people. Pretty simple right? After all Jesus implies the bad fish are evil and the good fish are righteous. And maybe fish are meant to refer to people, and maybe this is a recognition that at the end of all that we humans know there will be a separation by a force that is not human. If so, let’s remember that we really have nothing to do with that separation. Our task is to join the kingdom now and cast our nets wide so that every kind of fish, every person, is pulled in. The rest is for some other time and some other place. But what if the fish are not simply a symbol for humans. What if fish are symbols that work like the symbols in the other parables? That is the fish are about the ways, practices, policies, principles, the work, the norms, the actions of the world…including those of people, of businesses, of governments, of organizations and institutions and even churches. And what if the nets are about pulling in all of those ways, about separating the good ways from the evil ways, the ways that are Godly from the ways that are godless, the ways that are about grace and love and forgiveness from the ways that are about retribution and hate and violence and contempt… about casting such ways into the fire to be purified or consumed? We so easily jump from fish to people without considering that fish could mean much much more. It’s just may be possible that it doesn’t mean what we think it means. What we can say for sure, either way, is that the kingdom is like a net that pulls everything into itself. The kingdom is a net of grace luring everything to God. The kingdom of heaven is like a treasure that somebody hid in a field, which someone else found and covered up. Full of joy, the finder sold everything and bought that field. We know this story as the parable of the pearl. You’ve probably heard that pearl is God’s kingdom or the word of God. And it is a great and worthy thing so that we should give up everything else in life to get God’s word, to be part of God’s kingdom. But, I don’t think this means what you think it means. There are two stories here that sound a lot alike. And while the first does say the kingdom of God is like a treasure, the second does not. It seems that folks have assumed that the pearl of the second story is the treasure of the first story. But maybe not. You see, the second story clearly says the kingdom of God is like a merchant, not a pearl, not a treasure. Merchants were not highly regarded, they were thought of as thieves, as doing work that was evil. Why? In an agrarian society like the one Jesus hearers lived in, they produced goods first and foremost to use within their families. They did not produce things in order to sell them to make money to buy what they needed. That is our way of life. But in an agrarian society, more like that of the early frontier of this country, most folks worked to produced what their family needed. From this point of view, merchants were not needed or wanted. They were middlemen. They would make profits off of what someone else produced thereby limiting the value of the good for the person who produced it. This past week I listened to someone tell about how a prominent furniture store in another area of the country marked up the furniture it bought as much as 400%! Now how does the person who made a couch feel when they make it for, say $400 dollars. They get the $400 from the middleman, who then turns around and sells the couch for $1600, thus netting $1200 after paying the producer. The producer makes $400, the merchant makes $1200. Where is the fairness in that? The merchant did not even make the product, they just sold it! Now I am not dismissing sales people. But I am standing up for production.. the folks who made the good should not get a third of what the person who sold it gets. I see no justice in that. And neither did the people of Jesus day. Merchants were thought of as middlemen who stole goods and profits from those who actually mad then goods and products. Merchants were swindlers. The Kingdom of God is like a swindler. But not just any swindler. For this swindler finds a pearl of great value. Pearls were, in fact, one of the most valuable goods of this time period. And a pearl of great value is all the more significant. The merchant then does something crazy, something radical. He sells everything he has to buy the pearl. Now stop and think for a minute…what happens when a merchant sells everything she has to buy one thing that she does not sell? She sells herself right out of business. And for what? A piece of jewelry, a precious gem? That apparently she does not sell because she loves it so much. This is crazy, right! No one does that. You do not sacrifice your entire livelihood just for a house or a car or a jewel. You’d end up unemployed, bankrupt, with nothing to buy food, nothing to take care of you or your family. But that is exactly the point. The merchant leaves behind an old way of life that folks listening to this story would have recognized as evil and exploitative. You see, the kingdom is like a wealthy merchant who makes money of off other people but one day discover something new and amazing and decides to give up his old ways to gain this new thing. The kingdom is like a swindler who stops swindling. The kingdom is like an evil man who give up evil in order to be better. The kingdom is not like a merchant who hears a gospel message and goes on being a merchant, who tries to be a better merchant. No, The kingdom is about transformation, about changing ones way of life, about radical acts that totally reorient one’s way of life. The kingdom is about merchants who realize they can no longer be merchants. “Have you understood these thing?” Jesus asks us. Just like we have done throughout today’s service, pull out the old things from the chest of treasures…the books and writings and sermons and articles that help us understand context and interpretation and meaning and nuance. And pull out new things as well – conversations, contemporary thought and ideas, questions and doubts and reflections and revelations. Pull it all out because that is what folks do when they truly want to learn….they put everything on the table, the old and the new, and they turn it all over again and again until they take another step towards the kingdom, until the net pulls them a little closer, until the mustard weeds spreads a little farther into the garden, until the leaven transforms us a little more, until we find that we can no longer live our former ways but are ready to trad them in for God’s kingdom ways. May it be so with all of us. * This sermon was done in six short parts throughout our morning worship service. Each heading above is one part and each was five minutes or less.